How to apply for TSPSC Gurukulam Teachers,Non Teaching posts recruitment 2017: Online applying procedure for TS Residential School Teachers Recruitment, Step by step TSPC REIS Teachers Recruitment Online application form filling instructions, Application Submission for Residential School Teacherr. TSPSC has notified 7,306 vacancies in various Telangana Gurukulams. Online applications will be accepted from 18-04-2017 and the last date for submitting applications is May 4/May 06. In one of the largest notifications to fill up posts for teachers, Telangana State Public Service Commission (TSPSC) on 13/04/2017 notified 7,306 vacancies under Residential Educational Institutions Societies (REIS). 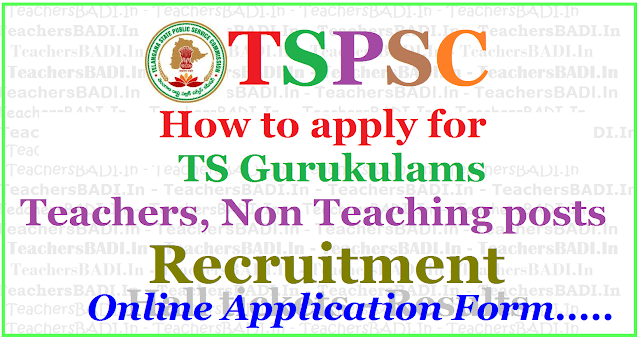 Under this TSPSC Gurukulam Teaching Non-Teaching Posts Recruitment, Librarian, StaffNurse, Music Teacher, Art Teacher, Craft Teacher, PGT Teacher, TGT Teacher, PET Teacher, PD Teacher posts would be filled in TREIS, TSWREIS, TTWREIS, TMREIS, MJPTBCWREIS Residential Schools for this year. In the Trained Graduate Teacher (TGT) category, the TSPSC has issued 4,362 posts while for PG Teacher category, the Commission has notified 921 posts. In the Physical Education Teacher (PET) category, the TSPSC has issued notification for 616 posts and for Art Teacher category there are 372 posts notified. In the Music Teacher category, the Public Service Commission has notified 197 seats. For Physical Director (School) category, the State TSPSC has notified six posts while for Craft Teacher category, the Commission has notified 43 posts. In the Staff Nurse category, the TSPSC has issued 533 posts and in Librarian (schools) category, the PSC has issued notification for 256 vacant posts. The full details of the vacant posts are available on the TSPSC website (www.tspsc.gov.in) and the online applications will be accepted from February 10, 2017, and the last date for submitting the online applications is March 4, 2017. A candidate has to verify the details as obtained from OTR database and displayed on the screen. If any details are to be changed, a candidate should go back to the TSPSC website and use the Edit OTR link. In addition to the details obtained from OTR database, Notification specific details such as Examination Centre opted, required qualification, university details, eligibility and accepting declarations etc. are to be filled by the candidate. Preview and Edit facility is available to make changes and submit for proceeding to Next step of making online payment of fee. technical qualifications, experience, and community are accepted only provisionally on the information furnished by them in their application form and is subject to verification and satisfaction of the Commission. Mere admission to any test or interview or inclusion of the name of a candidate in a Merit List will not confer on the candidate any right for appointment. The candidature is therefore, provisional at all stages and the Commission reserve the right to reject candidature at any stage of the selection even after the advice has been made. How to apply for TS REISs Teachers recruitment, TS REIS Non Teaching Posts Recruitment, TSPSC Gurukulam Teachers Recruitment, TSPSC Non Teaching Posts Recruitment, TSPSC Telangana Residential School's Teachers Recruitment.